We're offering an exciting opportunity to showcase your work! Want a chance for a large audience to see your work? Interested in Bristol Green Capital and sustainable transportation? Want to contribute to the public art of Bristol in a unique way? Then book out our artRIDE! 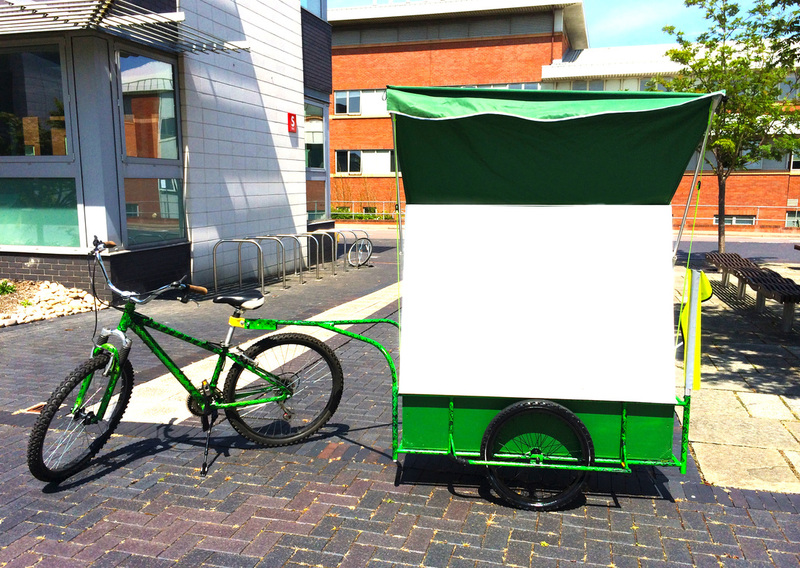 Bristol Parkhive is seeking artwork proposals for a new, funky portable exhibition space towed by bicycle! Display your work for the whole city to see and ride it around to parks and green spaces! Creativity calling! This portable exhibition bike trailer can be used to display two dimensional work, or be responded to as a unique, three dimensional space with sculpture, installation, light, sound, live art or performative elements—whatever your imagination can think up! artRIDE﻿ is a custom-built* billboard bike trailer, consisting of a wooden A-frame, two 9mm plywood boards, and two collapsible awnings to protect your work from the weather. Usable display space is 122 x 86 cm (a bit larger than A0), and the flatbed of the trailer is a cargo container- dimensions 122 x 56 x 28 cm. Attachments can be made to the boards or to the frame itself, if the boards are removed—whatever your ideas call for! Our only condition is that the trailer is returned to its original state after you’re done! We are asking for proposals of 100-200 words for how you would like to use the artRIDE space and why. Send in yours to Lisa Friedberg at Lisa.Friedberg@uwe.ac.uk TODAY!